The Town of Waterford Sanitary District is 1 of 85 independently governed sanitary districts in the State of Wisconsin. In 2010 Ruekert-Mielke, Inc. conducted a state-wide rate survey based on 70,000 gallons/household/year. Out of 343 districts in the State of Wisconsin the Town of Waterford Sanitary District No. 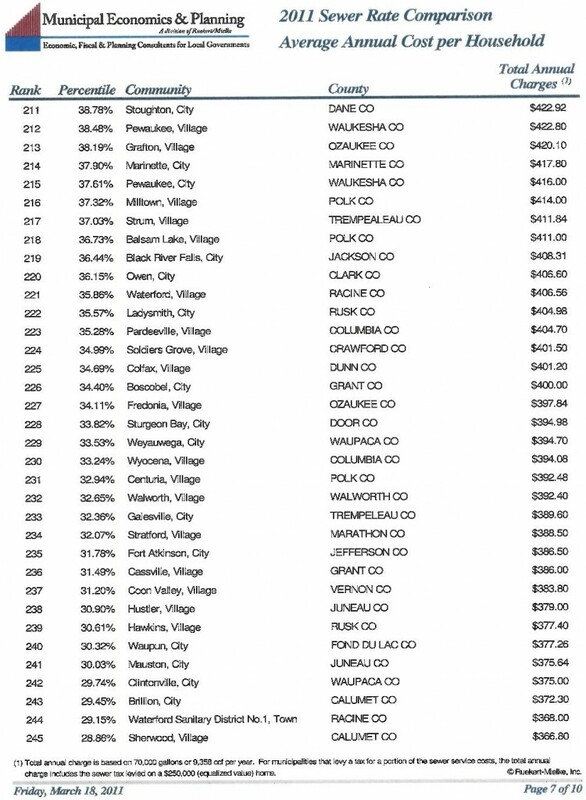 1 ranked 244 at 29.15% charging $368.00/year/household compared to the Village of Boyd which was the highest ranking 1st at 100% charging $1,133.50/household/year and the City of Greenfield which was the lowest ranking 343rd at 0.29% charging $136.92/household/year. The average is $501.01/household/year. The complete study can be viewed at the District office.